I can’t believe this is a real screencap from a DC Comics show in 2018. It’s nearly time for the CW’s vast array of DC comic book shows to return, and they’re all promising something new. New crossover action. New suits. New stars. New...naked bathroom fights? But only one among them is offering a unicorn. The CW has dropped a short teaser for Legends of Tomorrow’s return, promising more magic and new faces—including the welcome return of John Constantine, now as a series regular—and, of course, a lot more wackiness this season, as the crew gets ready to fight back against an oncoming darkness that John and Sara have become aware of. It wouldn’t be Legends at this point if there wasn’t a bit of wackiness to go with the superhero melodrama, would it? And boy howdy, even without the gloriously rainbow-spewing unicorn, there’s a lot going on here. The Beatles! Fairy godmothers! 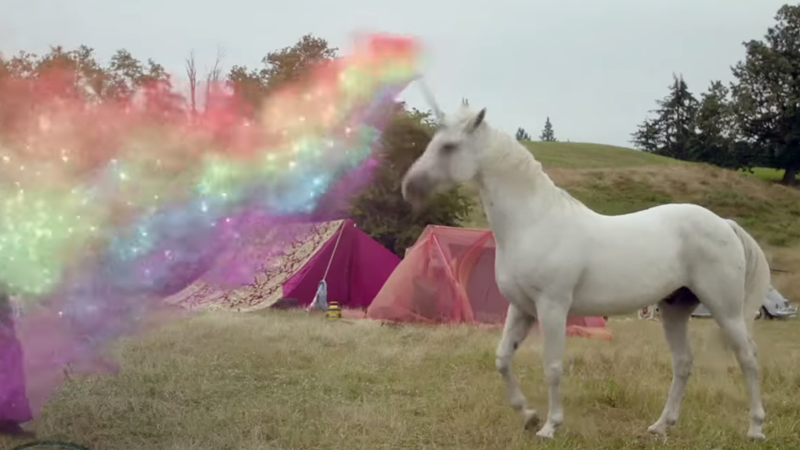 Did we mention the unicorn? The best thing Legends has ever done is embrace the farcical goofiness its first season very much lacked, and to see it getting even more fantastically weird is an absolute delight. Constantine’s right—we’re in for a hell of a ride. Legends returns to the CW October 22.